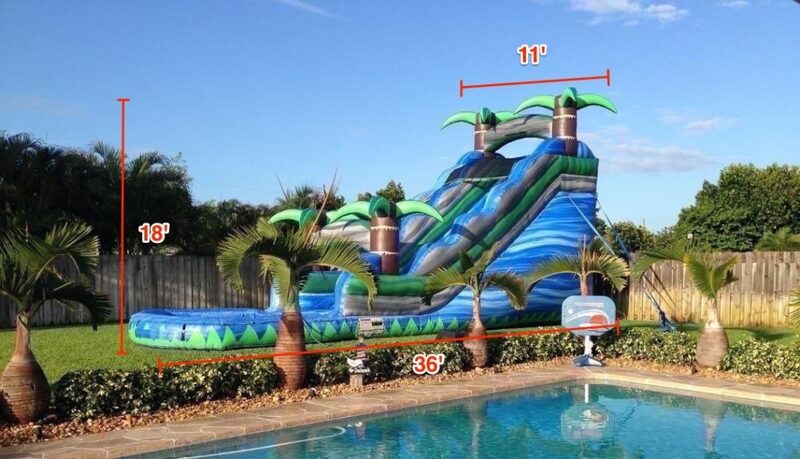 Does Your Backyard Measure Up For Inflatables? Inflatables make a wonderful addition to any backyard party. Before renting one, however, you need to break out the tape measurer for some pre-party planning. Decide on a guest list and choose an inflatable that is big enough to accommodate your party-goers. Be sure that electrical outlets are available (within 100 feet of the setup site) and that the size, surface, and grade of your yard will suit your rental. Follow these tips to ensure you’ve got a suitable space. Cramming a bounce house or a water slide into a small backyard is a bad idea for a few reasons. You want to be sure your guests have enough space to maneuver around the inflatable, and you don’t want to risk anyone getting hurt by sliding into a bush or the side of your house. 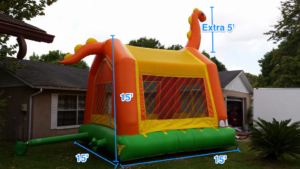 A typical square bounce house is approximately 15 feet tall, but some include appendages that reach higher. A bounce house requires about 16 feet of space in all directions, just for the unit itself. Count out another six feet on all sides to allow some leeway for installation and to give the kids room to move around the parameters. Larger inflatables, like obstacle courses or water slides, need a little more space. Water slides are usually 18 feet or taller. Some slides have landing options, like a pool to plop into or a long slip-n-slide to skid across. Slides with slip-n-slide landings can extend as far as 70 feet, so make sure to measure your yard before securing your next rental! Inflatables needs to be on a relatively level surface; the average residential yard is usually fine, but installing on a steep grade or large hill is not recommended. Smooth surfaces like grass or parking lot asphalt are best for a bounce house; avoid sharp gravel or large landscaping rocks for best results. Once you’ve secured the perfect setting for your inflatable, leave the set-up to the professionals and enjoy the party!